The delightful and unmistakable fragrance of bread baking came in a dream this morning. Perhaps it was Grandmother Esther making stollen in heaven? Bread was honored in pagan times as the staff of life. It is also a sacred symbol in prose and poetry. Stollen is one kind of traditional bread. It has been made since the Middle Ages. Here is a recipe to try, inspired by the vivid dream as I awoke. I found it included in a family kitchen notebook, handwritten over 80 years ago! Stollen is unique, a cake like bread, an elegant pastry. It’s a traditional gift of love and friendship. Often linked to the Christmas season, it can be a delightful surprise when served any time. Many are feeling anxious now during these times of personal and planetary change. It occurred to me that making some bread would be helpful, a constructive kind of therapy. In a large bowl, soak raisins, fruit and currants in apple juice for 1 hour; drain and set aside. In a large bowl, combine 1-1/2 cups of flour, yeast, sugar and salt. In a small saucepan, heat milk and butter to 120°-130°. Add to dry ingredients; beat just until moistened. Add the eggs, grated peels and extract; beat until smooth. Stir in the almond, fruit mixture and enough remaining flour to form a soft dough. Punch dough down; divide in half. Cover and let rest for 10 minutes. On a lightly floured surface, roll each half into a 12×8-in. oval. Fold one of the long sides over to within 1 in. of the opposite side; press edges lightly to seal. Place on greased baking sheets. Cover and let rise until almost doubled, about 30 minutes. Bake at 350° for 25-30 minutes or until golden brown. Cool on wire racks. Dust with confectioners’ sugar or combine glaze ingredients and drizzle over loaves. Yield: 2 loaves (14 slices each). 1. , combine 1-1/2 cups of flour, yeast, sugar and salt. In a small saucepan, heat milk and butter to 120°-130°. Add to dry ingredients; beat just until moistened. Add the eggs, grated peels and extract; beat until smooth. Stir in the almond, fruit mixture and enough remaining flour to form a soft dough. 3. Punch dough down; divide in half. Cover and let rest for 10 minutes. On a lightly floured surface, roll each half into a 12×8-in. oval. Fold one of the long sides over to within 1 in. of the opposite side; press edges lightly to seal. Place on greased baking sheets. Cover and let rise until almost doubled, about 30 minutes. 4. Bake at 350° for 25-30 minutes or until golden brown. Cool on wire racks. Dust with confectioners’ sugar or combine glaze ingredients and drizzle over loaves. Yield: 2 loaves (14 slices each). Playing dual roles, working as both a metaphysical minister and counseling astrologer, I am often called upon to officiate at marriage ceremonies. More often than not, those who are letting hope triumph over experience will be the ones seeking my assistance. That is, the marriage ceremony to be performed will be a blessing to unite those who have been married at least once before and are making yet another attempt at finding marital bliss. Often there are children of various ages who factor in and so a stepfamily situation is created. Problems with stepchildren contribute greatly to the failure of second or later marriages. There are some exceptions though. A heartwarming situation at a recent wedding service involved two young teenage daughters. They were ecstatically happy when they were included in the wedding ceremony. Their new stepfather gave each of them a beautiful gold necklace while voicing his words of love and protection as he and their mother exchanged rings. Recently a scene at a military wedding made national news in a similar way. A young boy touched thousands of hearts as he hugged his new step- mom when she married his father. These two examples seem to promise happily blended families. Still there are the social side effects which loom to challenge the establishment of a new family. Archetypes of the evil step mother in the fairy tales or a murderous and frightening stepfather shadow the explosive changes in traditional family structure which have mushroomed in recent times. Increasingly liberal attitudes toward divorce have made blended families almost the rule rather than the exception. Statistics reveal that it is quite rare for young adults to have both parents still married to each other and still alive as they grow up and prepare to begin their own families. Astrology offers valuable insight to those meeting the poignant situations which can arise while a new bride or groom is striving to understand and relate to new stepchildren. For single parents who are contemplating remarriage the birth chart of the new partner can also provide valuable insight into how he or she will affect the children involved. Astrology can ease the pain when a new bride or groom fears having to make a choice between the person they love and the children who need them. Begin by carefully studying the Eleventh House of the natal horoscope. It’s the indicator of stepchildren. The planets or luminaries there, their aspects, the sign ruling the cusp of the Eleventh House and finally the position of the planet ruling that cusp will paint a clear picture of what the stars promise and what can be done to ensure the brightest and best blended family. Here is an easy to use Sun sign guide to explore how each birth sign meets the stepparent role. Also consider the rising sign (ascendant) for more insight. Uranus rules your Eleventh House. Expect your stepchildren to be liberal free thinkers. Allow them to be independent and original. Develop tolerance for unpredictable or erratic behavior. They will be concerned about social and political issues. As they grow up ecology or humanitarian issues can be a focus. Always welcome their friends into the house and make sure they have the latest electronics, including telephones. Younger children will like science fiction characters, computer games, and art. They can be surprisingly intuitive, showing a flair for judging human nature. Uranus’ influence is an unstable one, so your step children might have two homes. They might come and go, perhaps at a moment’s notice. Neptune is your Eleventh House ruler. Elusive step children who might be a challenge to understand can be indicated here. Special needs can be a factor. Encourage the children to feel secure with you and remain receptive to their emotional states. Harsh words can be particularly traumatizing for them. A visit to a family counselor might help if there are genuine stumbling blocks. A touch of moodiness is likely. Creative ability might be present, expose them to music, dance, drama and other fine arts. There can also be an affinity for metaphysics and spirituality. Very young children will be vulnerable to those in need. Consider adopting a pet or getting involved with community charitable projects. At school your stepchildren might take the side of the underdog during playground squabbles or try to protect classmates who are cyber bullied. Mars rules your Eleventh house. This promises to bring energetic and assertive stepchildren into your life. Take an interest in their involvement with sports. There might be a talented athlete within your blended family. Leadership ability and strong personalities are indicated. There can be some arguments erupting or risk taking tendencies to monitor. Cope by taking a firm but fair stance. Your stepchildren will be attracted to all that is novel. The latest fads and fashions will appear at home. Ask them for their opinions about current events. They are very forward thinking, so let them help plan family vacations or other events. Encourage them to complete the projects they have already begun before starting something new. Patience and a focus on important priorities will help bring harmony to your blended family. Venus rules your Eleventh House. This can promise deep and affectionate bonds with a stepchild. Usually he or she will be anxious to please you. Stability and security at home will be welcomed. Be clear about what you expect and offer compliments at appropriate times. A stepchild with an early aptitude for finance can help with shopping and budgeting. Make it easy for your stepchildren to earn a little money of their own. A hobby could evolve into a family business or cottage industry. Very young ones might enjoy modeling with clay, gardening or planning camping excursions. They will also be fascinated by unusual stones. Encourage them to collect and identify these and to be aware of the healing and protective potentials within crystals. Encourage appreciation for music. Singing or playing instruments together can facilitate happiness and help a stepchild discover natural talents. Mercury rules your Eleventh House of stepchildren. Over all they will be clever, quick and do well in school. Alert and curious, your step children can acquire exceptional vocabulary and language skills while quite young. Try introducing them to word games such as Scrabble or crossword puzzles. This would help them make the most of their precocious word skills. Travel will delight them, they can enjoy family outings to new destinations. When it’s age appropriate they will appreciate bicycles and eventually learning to drive. Anticipate a certain duality in their personalities. Versatile, they tend to get involved in a variety of projects simultaneously. However they can be nervous and volatile at times. Cope by encouraging them to think things through and continue learning from experiences. Younger children can be real chatterboxes. The Moon is linked to your Eleventh House. Your stepchildren will be intrigued by the family heritage and will enjoy history. Family loyalty can be a source of concern. If there is tension between a natural parent and the new blended family try to keep the children out of heated controversies. Often a grandparent figure will be influential in guiding these stepchildren. They will be in tune with those older or younger. Let them be aware of your own emotional needs and talk about positive factors in your own early family life. Scrapbooks, photo albums, cherished collectibles and memorabilia can be meaningful treasures to your stepchildren. Respect their keepsakes. Share family recipes, make mealtimes happy occasions for interacting. Younger children can enjoy learning to cook. Introduce them to preparing meals which are nutritious and appealing. The Sun is the ruler of your Eleventh House. The issue of stepchildren can be really pivotal for you. Prepare for them to shine like the Sun. They can be central to your entire life and marriage. These stepchildren will be loving and magnanimous but rather demanding. Show appreciation for their accomplishments by offering praise when it’s merited. A stepchild might become something of a celebrity, winning scholarships or other awards in the community. Enthusiasm for attending concerts, newly released films, theme parks and special events can characterize them. As they grow older your stepchildren will tend to be very social. Expect them to take the initiative in developing a wide social circle in which they will star, being quite popular. They will insist upon quality, usually not settling for less than the best. Your stepchildren are ruled by Mercury, ruler of your Eleventh House. But in not quite the same way as are the stepchildren of Leo stepparents. Mature and critical, they will be talkative and always ready to point out how things might be improved to benefit the family. Neat, clean and orderly, their intentions are to be helpful. Keep a sense of humor if at least one step child is a fuss budget. On the whole you can expect them to be astute and do well in school. Subjects which demand analytical ability can be their forte. Health care is likely to be a focus. One step child might have a health condition which must be addressed occasionally. Shyness or nervousness might be a part of this. Encourage the younger children to develop self confidence. There can be a special love for pet birds, rabbits or other animal companions. Venus rules your Eleventh House of stepchildren, but from a different angle than is the case with Cancerians. An appreciation for balance, justice in choices related to family life, and a sense of fair play will characterize them. Very social and oriented toward sharing and teamwork, your stepchildren won’t want spend time alone. Attending parties and community events which they can share with loved ones will delight them. They will exhibit a strong social awareness, knowing instinctively that people need each other. Cultural events such as fairs, folk music festivals and art shows can hold great appeal. Encourage their creativity. These stepchildren usually are physically attractive, have very good manners and are genuinely considerate. They might enjoy competing in talent or beauty contests. Pluto is the ruler of your Eleventh House of stepchildren. Encourage the children to be open with their plans and confidences. They can tend to be secretive and often are a challenge to understand. Honor their need for privacy. Dignity and mutual respect should be accented in order to develop the best relationship possible with stepchildren. They have a yearning to learn all about life and will show a precocious interest in death and also romantic intimacy. They will be intuitive, especially concerning tensions within the family. Don’t allow them to pit one parent against another or try manipulation. Detective stories, monster movies and science are all topics they might enjoy. Younger children will be thrilled by water sports. Encourage them to swim, sail or study aquatic life. Jupiter rules your Eleventh House of stepchildren. This is fortunate. Usually an instant rapport is established. Eventually the relationship can deepen into a very good friendship. Offer shared experiences involving church attendance and other spiritual activities. Stepchildren will be responsive and helpful if you entrust them with important tasks. Horses, large dogs or even exotic pets can be much loved by your blended family. As they grow up your stepchildren might enjoy hosteling or exploring study abroad opportunities. Camping, hiking or horseback riding trips can also help to bring the family closer together. Anticipate a competitive spirit. From baseball to board games such as checkers, your stepchildren will always play to win. Saturn rules your Eleventh House of stepchildren. The accent here is on responsibility. Dedication and patience will help in building an enjoyable relationship over time with your blended family. There might be some initial resentment or pessimism to rise above on at least one family member’s part. Financial obligations, perhaps involving needed tutoring or dental care, can be a factor. Your stepchildren will tend to blossom if the home environment is kept stable and predictable. Young children can surprise you by displaying an aptitude for concentration and persistence. Discover their areas of special interest and enroll them in appropriate classes outside of school. Yoga lessons, sewing or carpentry are some possibilities. 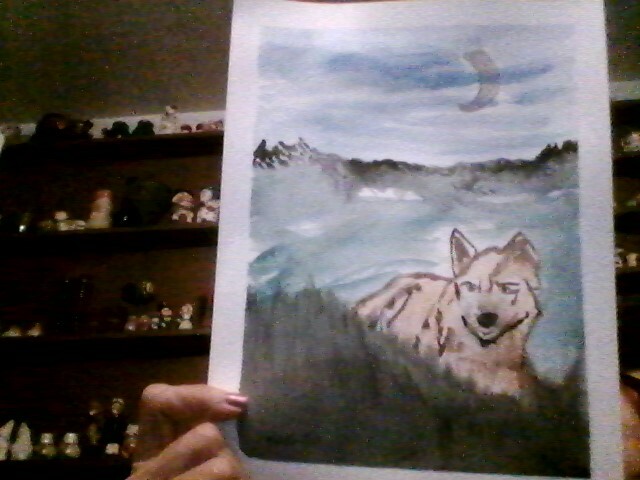 The Coyote. A survivor. He might mutate into one of the creatures which will flourish in the post Earth changes world which will soon emerge. Coyote brings a message as he waits and watches. It is moonrise. The dunes mark the ocean beyond, dark colored, they rise above the swamp. Coyote carefully treads the thin line of grass edging the tidal pool. It is all a metaphor, easily observed. The whole of this new life is contained in the midnight green grass. Within which holds the promise. As far as coyote’s eyes can see his world is diverse and captivating, marked by shadows on the ground. Resting amid the breaths, the pulse of nature. The sky above is the new poetry. 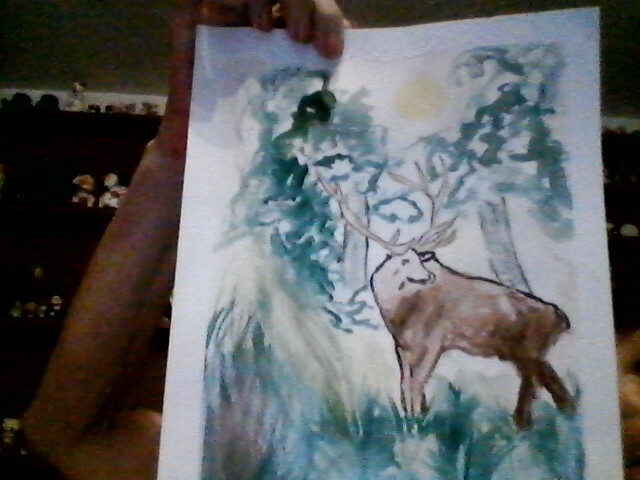 Elk – original water color by Dikki-Jo – Totem of Sagittarius in the Native American Medicine Wheel Zodiac.